The holiday season is a great time to gather with friends and family to bake yummy recipes. Whether organizing a cookie swap, baking homemade presents or enjoying the baked goods at home; the Kenton County Public Library can lend you hand with it’s wide array of available materials and free events. On Sunday, December 20 from 2-4pm, Teens, ages 11-18, can make holiday candies to give as presents at the Covington Branch Library during the Candy Shop program. Check out the library’s Pinterest Holiday Yums board for more ideas. Don’t forget the Holiday tunes while baking! There are electronic (Freegal and Hoopla) and hard copies of favorite holiday songs available at your Library. Prepare desired-flavor cake mix according to package directions. Use any suggested pan size and bake according to package directions. Cool in pan on a wire rack. Line trays or baking sheets with parchment or waxed paper; set aside. Remove cooled cake from pan and crumble into a very large mixing bowl. Add desired-flavor frosting. Beat with an electric mixer on low speed until combined. Using a small scoop, drop mixture into 1 1/2-inch mounds onto prepared trays; roll mounds into balls and freeze for 30 minutes. In a small microwave-safe dish heat 1 ounce of the coating (about 1/4 cup) on 50% power (medium) for 60 seconds until melted and smooth, stirring once. Dip one end of each lollipop stick into melted chocolate and poke sticks into balls (this helps the balls stay on the sticks). Freeze for 30 to 60 minutes more or until balls are firm. Place remaining candy coating and chopped chocolate in a small saucepan. Heat over medium-low heat until melted and smooth, stirring frequently. Working in batches, dip balls into melted chocolate mixture. Allow excess to drip off; place balls on clean waxed paper-lined trays or baking sheets. After coating is set, transfer to storage containers and store, covered, in refrigerator. Let stand at room temperature at least 30 minutes before serving. Use white cake mix, Raspberry Frosting, semisweet or dark chocolate, and chocolate-flavored candy coating for dipping. Before freezing the mounds of dough in Step 2, form each mound around a fresh raspberry. Use chocolate cake mix, Almond Frosting, semisweet or dark chocolate, and chocolate-flavored candy coating for dipping. Before freezing the mounds of dough in Step 2, form each mound around a well-drained maraschino cherry. Use white cake mix, Basic Butter Frosting, and vanilla-flavored candy coating and white baking chocolate for dipping. Stir 1 cup crushed chocolate sandwich cookies with cream filling into crumbled cake. After dipping pop, sprinkle with 1/2 cup crushed chocolate wafer cookies while coating is still wet. Use chocolate cake mix, Peanut Butter Frosting, chocolate-flavored candy coating and semisweet or dark chocolate for dipping. Stir 1 cup chopped chocolate-covered peanut butter cups into crumbled cake. After dipping pops, sprinkle with 1 cup finely chopped dry roasted peanuts while coating is still wet. Use carrot cake mix, Basic Butter Frosting, and vanilla-flavored candy coating and white baking chocolate for dipping. After dipping pops, sprinkle with 1 1/2 cups finely chopped toasted pecans while coating is still wet. Use yellow cake mix, Coffee Frosting, and vanilla-flavored candy coating and white baking chocolate for dipping. After dipping pops in white chocolate, sprinkle with 1/4 cup crushed chocolate-covered espresso beans while chocolate is still wet. Use white cake mix, Basic Butter Frosting, and vanilla-flavored candy coating and white baking chocolate for dipping. Stir 1 cup toasted flaked coconut into crumbled cake. After dipping pops in white chocolate, sprinkle with additional 1 cup toasted flaked coconut while chocolate is still wet. Use lemon cake mix, Lemon Frosting, and vanilla-flavored candy coating and white baking chocolate for dipping. After dipping pops in candy coating, sprinkle with 1/4 cup finely crushed hard lemon candies (drops) while chocolate is still wet. Use devil’s food chocolate cake mix, Chocolate Frosting, and chocolate- flavored candy coating and dark chocolate for dipping. After dipping pops, sprinkle with 1/4 cup miniature semisweet baking pieces while chocolate is still wet. Use confetti cake mix, Basic Butter Frosting, and vanilla-flavored candy coating and white baking chocolate for dipping. If desired, tint vanilla candy coating with paste food coloring. After dipping pops, sprinkle with 2 tablespoons decorative confetti candies while coating is still wet. Use white cake mix, Peppermint Frosting, chocolate-flavored candy coating, and semisweet or dark chocolate for dipping. Stir 1 cup miniature semisweet baking pieces into crumbled cake. After dipping pops in chocolate, sprinkle with 1/2 cup shaved layered chocolate mint candies. Use red velvet cake mix, Basic Butter Frosting, and vanilla-flavored candy coating and white baking chocolate for dipping. Reserve 1/2 cup crumbled cake. After dipping pops in white chocolate, sprinkle with reserved crumbled cake. 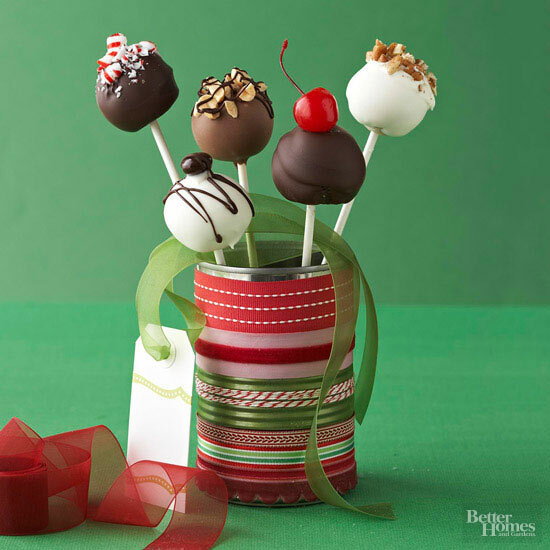 If you don’t want pops to have a flat side, poke the ends of the lollipop sticks into Styrofoam or floral foam to suspend the pops until chocolate is set. Layer cake pops between sheets of waxed paper in an airtight container; cover. Store in the refrigerator for up to 1 week or freeze for up to 1 month. In a medium mixing bowl beat butter with an electric mixer on medium speed until smooth. Gradually add 2/3 cup powdered sugar, beating well. Slowly beat in 2 tablespoons milk and vanilla. Gradually beat in the remaining 2 cups powdered sugar. If needed, beat in additional milk, 1 teaspoon at a time, to make a frosting of spreading consistency. Prepare frosting as directed, except substitute 1/2 teaspoon almond extract for the vanilla. Prepare frosting as directed, except substitute 2 tablespoons unsweetened cocoa powder for 2 tablespoons of the powdered sugar. Prepare frosting as directed, except add 1 1/2 teaspoons instant espresso coffee powder or instant coffee crystals. Mix with the 2 tablespoons milk to dissolve before adding. Prepare frosting as directed, except substitute lemon juice for the milk and add 1/4 teaspoon finely shredded lemon peel. Prepare frosting as directed, except beat 2 tablespoons peanut butter into butter before adding powdered sugar. Prepare frosting as directed, except substitute 1/8 teaspoon peppermint extract for the vanilla. Prepare frosting as directed, except beat 1/4 cup seedless raspberry jam into butter before adding powdered sugar. Use one 1 tablespoon milk and omit vanilla. Hope you have Sweet Holidays with your loved ones!